All Australian Casino, the sister site of All British Casino, is dedicated to Australian online casino players. However players from outside Australia area also welcome. The online casino operates under a license granted by the Lotteries and Gaming Authority (LGA) of Malta and invests a great deal of money into providing the ultimate online gambling environment for its customers. The online casino boasts of offering 100% fair games with excellent payout percentages. For example, the games of roulette, blackjack, and Punto Banco at All Australian Casino have payout percentages of over 97%, over 99.3%, and over 98%, respectively. Players can rest assured that these games are as random as those played in land-based casinos as All Australian Casino has a sophisticated random number generator (RNG) that cannot be manipulated by either the casino staff or its customers. The sensitive personal and financial data is also protected with a 256-bit SSL encryption, ensuring no one manages to steal your credit card information or passwords while you make a deposit at the casino. The design of All Australian casino is simple, easy to understand and even easier to navigate. The casino website is deeply rooted in all things Australian with the backdrop portraying the Australian outback. The entire casino website is yellow and black in colour and the different categories placed on the site makes life a little easier to find what you are looking for. The different game categories on their casino site starts with a ‘Popular’ section, giving you the most popular games that are currently being played in each of their game categories. Next, you will see a ‘Pokies’ section that will give a breakdown of all the different video slot games, including the type of themes to ensure you do not get confused. You also are able to get a breakdown on all variations of classic slots under the ‘Classic Pokies’ section and a full description of all the available table games on offer under the ‘Table Games’ section. All Australian casino also offers live casino, and you can learn more about it simply by clicking on the ‘Live Casino’ tab on the casino website. Furthermore, this brilliant online casino also has a section for 10 types of progressive jackpot games that are on offer and a ‘Video Poker’ section to present their four different video poker games available on their casino. Lastly, the game section is completed by an ‘Other’ section where you will find games like Bubble Bonanza, Enchanted Woods and Four by Four which is considered their specialty game section. 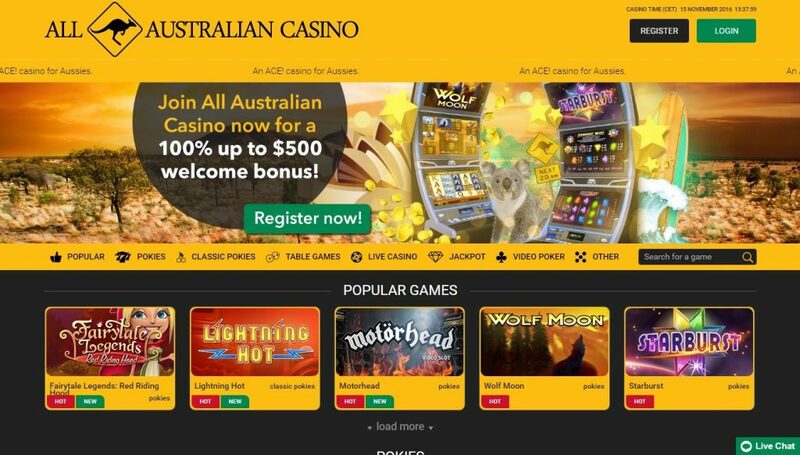 All Australian Casino goes beyond providing different sections for their games by implementing various other sections including a ‘Home’ button to easily find your way back to the home screen when you ventured into the unknown and needed to quickly find your way back to the casino’s homepage, a ‘Deposit’ and ‘Withdrawal’ button will provide all the required information you need to successfully make a deposit and will also give you some insight on the different payment methods they have on offer. You will also notice a ‘Support’ button to give you all the different ways to reach the support team and what personal information is required when logging a query with them. Lastly, you will see a ‘My Account’ section to login easily and a live chat button located in the bottom right-hand corner when you quickly need a question answered. All Australian Casino welcomes new players with a cash-match bonus of 100% up to $50 on their first deposit amounts. For instance, players who deposit $10 into their online casino accounts will receive a welcome bonus of $10, making it a total of $20 in their accounts. Claiming the bonus is as easy as registering a real play account and making a deposit using reliable banking methods such as credit/debit cards or ewallet solutions. The bonus comes with wagering requirements of x35. However, the online casino doesn’t force players to accept its new player bonus. All Australian casino features enough slot games to basically please any kind of slot enthusiast looking for a wide range of slot games, especially from Net entertainment. All Australian Casino features every slot game they develop including the hottest and freshest game titles such as Blood Suckers, Gonzo’s Quest, The Wish Master, Scarface and Lost Island to mention a few. All the slot games are packed with high-quality graphics and fantastic bonus features. All Australian Casino also comes with classic 3 reel slots with traditional graphics including Safari Madness, Gold Rush, and Mega Joker. For those who enjoy table games, All Australian casino provides a wide variety of different table games to suit your needs. These include three variations of Blackjack and three variations of Roulette. Furthermore, you will also be able to enjoy Baccarat, Oasis Poker, Caribbean Stud Poker, Texas Hold’em and Red Dog. All Australian casino’s video poker section is just as impressive with four main variants including Joker Wild, Deuces Wild, All-American, and Jacks or Better. The video poker games can be played from 1 to 100 hands at a time, giving you the ability to choose how much you are willing to spend on your bets. All Australian casino also features specialty games that include Golden Derby, Bonus Bingo, and Keno to complete their range of games available at their casino. Most ofAll Australian casino’s slot games and table games are available on all mobile platforms. You will be able to access all the games by simply loading the casino’s website on your tablet or smartphone web browser. The mobile games featured on All Australian casino come standard with the same high-quality graphics and operate smoothly without any hassles or interruptions while you enjoy your favorite game. Established in 2013, All Australian casino is still considered a newcomer in the online casino industry and therefore have yet to claim an award for their efforts as an online casino entity. However, they are ranked quite high up the ladder when you search for the best Australian online casinos on the web. All Australian casino can be enjoyed from anywhere in the world with a good internet connection, although they are mainly targeted at the Australian market. However, there are a handful of countries that will not be able to enjoy All Australian casino, and these include the United States, Union of Soviet Socialist Republics, Turkey, Spain, Romania, Portugal, Italy, France, Estonia, Denmark, Bulgaria, and Belgium. All Australian Casino has a prompt customer support system. Players can use the telephone number +61 (0) 2 8006 0112 anytime from Monday to Sunday, between the hours of 7:00 a.m. and10:00 a.m. If players need help immediately, they can use the site’s live chat facility. There is also an online contact form, through which players can use. However, prior to contacting a customer care representative, you can try finding answers to their queries at the Frequently Asked Questions (FAQ) section of the casino website. All Australian casino is packed full of fantastic advantages to ensure you have the best possible gaming experience when you decide to register a new account with them. The casino interface is simple and very easy to understand, especially the instant-play mode available at the casino. The casino software is also compatible with most tablets and smartphones and features a full arsenal of Net Entertainment games. All Australian casino offers live casino games presented from the Portomaso Casino situated in Malta including a casino studio to brighten your day. The casino’s support services are brilliant with international calls and their live chat facility operating 24 hours a day, 7 days a week. The casino is tested regularly by TST to prove they are fair and provide security with a 256-bit SSL encryption. The only disadvantages to such an innovative online casino is the fact that they do not accept players from Italy, Estonia, France and the US and the support representatives are not always available during the afternoon, making it a bit of a hassle when you have an important question that needs to be answered immediately. Casino players will definitely find the authentic Aussie casino gaming experience at All Australian Casino. The casino is not only safe and secure, but also runs a number of lucrative promotions, giving players the chance to win cashas well as non-cash prizes, free spins on new slots games, weekend bonuses, and reload bonuses. There are also loads of NetEnt games to choose from that will keep you entertained for hours on end. Furthermore, All Australian casino keeps you up to date with the latest news from around the world and provides excellent customer support for those who need a bit more convincing before registering a new account. All Australian casino also features most of the payment methods available today and provides fast and hassle free payments once you wish to make a withdraw from your casino account.